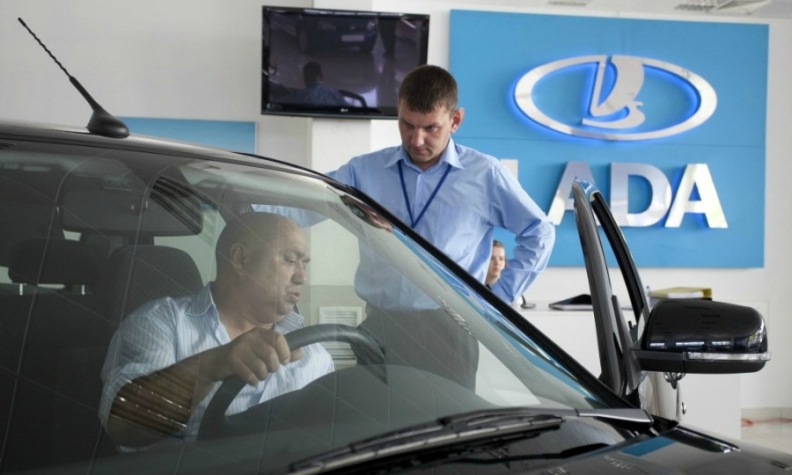 AvtoVAZ, which makes the best-selling Lada brand, expects sales to fall by 10 to 15 percent in 2014, less than the overall Russian market. ST. PETERSBURG, Russia (Bloomberg) -- Russia's car market will shrink by as much as 20 percent this year as economic growth slows, AvtoVAZ CEO Bo Andersson said today. Last year, deliveries in the market were down 6 percent, according to the Association of European Businesses in Moscow. The next two years will be "tough" for the Russian market, Andersson said in an interview at the St. Petersburg International Economic Forum. The executive said he expects AvtoVAZ's sales to fall less than the industry, by 10 percent to 15 percent, allowing the carmaker, which is controlled by Renault-Nissan, to increase market share to 20 percent in 2016 from 17 percent now. The sanctions imposed on companies, officials and businessmen close to President Vladimir Putin by the United States and the European Union after Russia's annexation of Crimea haven't contributed to the downturn, Andersson said. AvtoVAZ's sales slid 15 percent in the first four months to 128,633 compared with the same period last year. Overall, the market dropped 4 percent to 829,046 in the same period, the AEB said. AvtoVAZ's sales decreased 7 percent last year, pushing the company to a loss of 7.7 billion rubles ($225 million) versus net income of 29.1 billion rubles in 2012.